The intensity of storms is increasing, and that means more rain water filling up our storm drains. All of that rain water has to go somewhere, so how do you keep that water from flooding your property? Once rain hits the ground and starts to flow, it’s called stormwater. Stormwater causes all kinds of problems, from flooding property to contaminating drinking water. 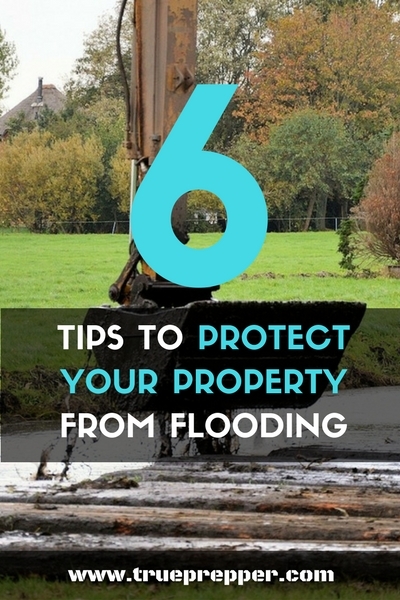 Here are 6 tips to help protect your property from floods caused by stormwater. Water always follows the path of least resistance, and that’s usually downhill. The goal is to adjust that path to move the water away from valuables. 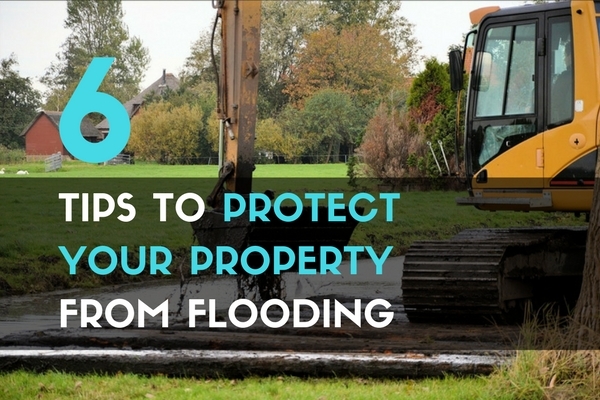 You usually won’t be able to completely stop flowing stormwater, so focus on routing stormwater to areas that drain well and won’t flood your house or your neighbor’s house. Make sure you know if your insurance covers property damage from water run-off. Most policies (including flood insurance!) do not cover “ground-water runoff”, also known as stormwater runoff. Homeowners often don’t see the distinction, but most insurance companies call it a flood only if it comes out of a body of water. Impervious surfaces, like driveways, roads, and roofs don’t let rain soak in. Any rain that falls on these impervious surfaces runs off, and this is the water that will cause you the most problems. Do your best to limit the amount of runoff from impervious surfaces that drain to other impervious surfaces. Do this by diverting your gutter downspouts from impervious surfaces to areas that let the water drain into the ground (and away from your house!) like your yard or a garden. You can also divert flow into a rain garden, which is a garden that’s purpose is to store and soak up stormwater. You can do some research to see what plants are best for a rain garden in your specific area. Plants love water, so let plants do the work for you and help your flooding problem! Place drains around impervious surfaces that flood often. If possible, use a drain leading to corrugated pipe with a fabric sock on it and with 10” of gravel on all sides. This allows drainage until capacity, and then the excess water will runoff. If there is a possibility of that setup clogging, use a drain going into 3” or 4” PVC pipe that drains to a safe collection area. Remember to clear drains and the area upstream from drains before a storm. If the volume of stormwater is high, place water breaks where possible that diverts water paths sideways and slightly downhill rather than straight downhill. You can see this in action on many unpaved paths on hiking trails. In that scenario, trail builders use landscape timbers to channel water at an angle. This lowers erosion and diverts flow. A homeowner can use any wood, including boards, logs, or tree limbs to do the same. Go outside when it rains (not during dangerous storms!) and watch where the water goes. If you make an adjustment then, you can see immediate results! Work your way along the flow until the new path is running well, or just mark areas to work on later after it’s done raining. Thanks for the tip to use a drain leading to a corrugated pipe with a fabric sock on it and 10 inches of gravel on all sides to allow drainage until capacity and then runoff. I am looking for ways to improve my stormwater drainage, and that might be a way to improve my system. Perhaps I’ll talk with a contractor to see what else I could do to improve the drainage for my home.